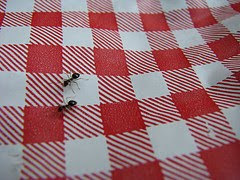 Have you ever delighted in watching an ant haul a Goldfish flake or cracker bit over a grassy terrain? The little guy works so hard. Only I would think about what the ant envisions. Does he imagine he’s an African elephant transporting loads of valuable cargo over the Himalayas? Here’s my confession today: I like to work (sick & wrong, right?). My parents instilled a strong work ethic in me that only intensified as I learned to apply Col. 3:23 (Whatever you do, work at it with all your heart, as though working for the Lord, not for men…). My mom ironed for hours at a time. Blech. My dad spent chunks of his weekend working in the yard or scraping paint off his boat. Some of my favorite memories with him involve weeding and scraping. My folks also enforced a rule that we were not to move home after college but head out and secure a job. That I did. In high school one of my friends liked to tease me by calling me janitor. I made it a regular habit to clear off any remaining napkins and items left on our cafeteria table and I even went so far as to wipe the table down every day. Less work for him, I figured. I got mocked for it. This fervor for work can be both a blessing and a curse. I wake up excited to write, edit, create and parent. Yesterday my family spent over an hour yanking out pesky weeds that sprouted up through our patio stones. Guess what? I had fun. I enjoyed spending time with my girls, teaching them about the benefits of working diligently and that great feeling of accomplishment that follows. I don’t smile and adopt a Snow White whistle while I work attitude with all things, but for the most part I love how it feels to dig my hands in and get something done. So what’s the curse, you ask. Remembering the model God set for us when He rested on the seventh day? I need to learn to chill sometimes. I’d be wise to take heed of God’s example and the way of the ant. 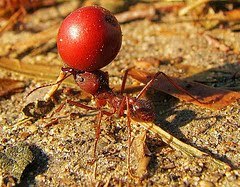 Ants aren’t always trekking around with forty times their body weight upon their backs. They know all about attending the party at the picnic (where they still are likely to work…okay, enough…I get it). Who do you want to thank for your work ethic today? Oh, Wendy, I LOVE this post...and the photo. You do such a great job of teaching without smacking our heads with it!!! Hmmm. My parents for sure. AND the Holy Spirit, Who sometimes whispers, "Tick, tock, tick tock, tick tock, people. Time's slippin' away." My father impressed on me, from an early age, through words and actions, how important the work ethic is. Not only to work, but to be the best I could be at whatever I did whether it was sitting alone in the garage sorting nails and screws into glass jars for his business(boring!) or being the director of a company. what a poignant post. I too was taught to work hard (a daughter of immigrants)...SO, this is a good reminder for me. What a wonderful post, Wendy. I confess your writing often inspires and intimidates me because you have such a lovely way with words that I can never hope to reach. I owe my work ethic to my paternal grandmother. She raised 6 children of her own, took in over 50 foster children, volunteered everywhere, and never sat down that she didn't have a piece of needlework in her hands (unless she was reading - another way she inspired me). I also would like to thank you for putting that work ethic specifically in my mind today. The heat here this summer has drained much of it from me, but you've inspired me to tackle a pile of undone work today. My Mom was the hardest working person ever. She used to say "If you're going to do something, do it right." She also knew how to enjoy a good picnic. I am so glad for her example. Thanks for the reminder! My dad is the hardest working person I know. He doesn't stop from dawn till dark, then gets up and does it all over again. So glad I'm not the only one! I LOVE working. Thank you, Mom, Granddad, and my husband Kevin for teaching, setting an example, and encouraging. I think God expects us to bear fruit. He's invested eternity in us, after all. But I also love to play. I try to add fun to every task, or it sours on the vine. I Do like work but on my own terms. Selfish I know. But, I do try and do all things like I was doing them for the Lord. I love how he honors that and has mercy on us when we humble ourselves so. My parents worked hard. I remember my Dad walking six miles to work and back during a transit strike. That's an interesting way to look at the ant.. I'm very much the same as you, Wendy! And I've been working hard :-) at training my children to be diligent too. I'm trying really hard to reserve the Sabbath for a day away from my work, especially from the internet. It's challenging! But it's good for my family to know that I can stop and rest, enjoy them, and we can be together without work too. My parents are incredibly hard workers who also love to have fun. I come from a line of salt-of-the-earth wheat farmers, body shop men, who had to work their fingers to the bone to survive.